The naming of several of Broadmoor streets are unique as Broadmoor is itself: Stewart Avenue was named after E. B. Stewart, Secretary of the Stoneson Development Corporation. Maddux Drive was named after Parker S. Maddux, President of the San Francisco Bank. Mr. Maddux was a signatory on the original Covenants, Conditions & Regulations (guidelines established to enhance the quality of living and preserve property values) for the Broadmoor community. Historic State Highway 82, known as El Camino Real, runs through Broadmoor. In 1769, El Camino Real, or “The Royal Road”, was just a footpath begun by the Franciscans led by Father Junipero Serra that joined the twenty one Franciscan Missions, Pueblos, and Presidios. It is a continuous road over seven hundred miles in length and is marked by the unique and picturesque Mission Bell guideposts which originally gave distances between the principal towns and directions to the Missions. The bells are placed along the road not merely as landmarks and guides to travelers, but as testimonials to the work of the Franciscan padres who were the pioneers that settled California in 1769. 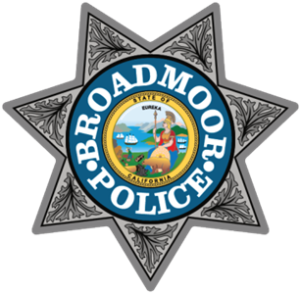 The average response time to calls made to the Broadmoor Police Department for service is under three minutes. 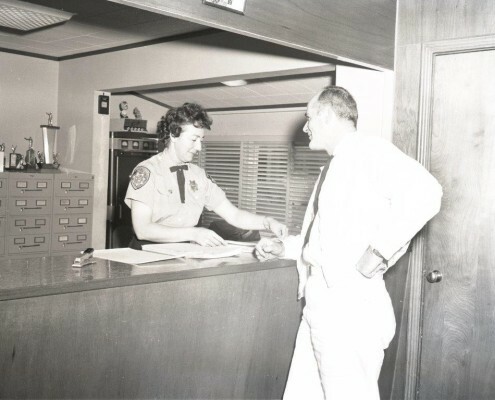 In 1948 Police Protection Districts were common in California although on October 1, 1959, the state legislature abolished the formation of new police protection districts. The remaining police protection districts were allowed to continue in operation. 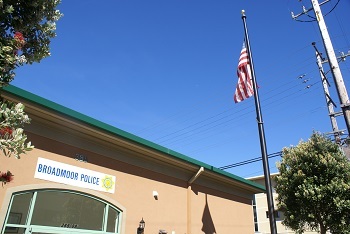 By 1986 Broadmoor was the only remaining Police Protection District operational under the California State Health and Safety Code. The District has operated continuously since 1948 with the exception of a period from January 1, 1977, to February 1978. During that period there were difficulties in acquiring suitable liability insurance. The difficulties stemmed from self-serving political interests of two police commissioners who were eventually voted out of office in November of 1977. Subsequent contractional agreements with the City of Daly City and the San Mateo County Sheriff’s Office maintained police services to the District during this period.